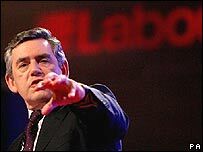 Gordon Brown has used his first Labour Party conference speech as leader to promise: "I will not let you down." The prime minister said he was a "conviction politician" who wanted to "defend and extend" British values and help everyone reach their potential. The build up to his speech was dominated by continued speculation over whether he will call a snap election. Mr Brown, who did not mention any election in his speech, has so far refused to rule out an autumn poll. In a BBC interview ahead of his speech he said he was "getting on with the job" of implementing Labour's manifesto from 2005, adding: "Do I need to call an election to do so? No." Mr Brown began his speech by talking about some of the challenges he has faced since coming to power, from the failed terror attacks in London and Glasgow to foot-and-mouth. "Britain has been tested and not found wanting. This is who we are," said Mr Brown, who had received a standing ovation as he arrived in the hall. Mr Brown said he was a "conviction politician" who stood for a "Britain where we all have obligations to each other and by fulfilling them, everyone has a chance to make the most of themselves". But there was no mention of Conservative leader David Cameron or Lib Dem leader Sir Menzies Campbell - and none of the political knockabout or jibes at opponents normally found in party conference speeches. There were few jokes, with Mr Brown admitting: "Sometimes people say I am too serious and I fight too hard and maybe that's true." Instead he spoke of his own life-changing experience of the NHS - when he almost lost his sight after a rugby accident - and the education system. His "pledge to the British people" was "I will not let you down. I will stand up for our schools and hospitals, I will stand up for British values. I will stand up for a strong Britain and I will always stand up for you". He also praised the strength and stability of the British economy, which he said helped it weather a "recent wave of financial turbulence" - his only reference to the Northern Rock banking crisis. He pledged to push for full employment and repeated his promise to create "British jobs for British workers". On housing, which Mr Brown has said is a top priority, he said he wanted two million more home owners by 2010, compared to 1997. He said the government would build ten new "eco-towns" - double the original number announced earlier this year. On law and order, Mr Brown said "my answer to crime and disorder - our policy - is to both punish and prevent". He announced an extension of stop and search and dispersal powers to tackle the rise in gun crime. He also said public services had to be more personalised, saying people needed to be treated "not as a number, but with respect". He also confirmed plans for a deep-clean of hospitals over Christmas and the New Year in the fight against the MRSA bug. "Do our duty and discharge obligations" in Afghanistan and Iraq by working towards three objectives "security, political reconciliation and economic reconstruction". Fight for "justice" for the people of Darfur. Double the number of hospital matrons to 5,000 and give them the power to sack contract cleaners, who did not "meet the highest standards of cleanliness". Mr Brown who became prime minister by succeeding Tony Blair as Labour leader, had earlier said his policy plans included reviewing some past Labour initiatives - such as 24 hour licensing and reclassification of cannabis - if he felt they needed reform. On binge drinking, particularly among teenagers, he said it was important not to send out the wrong message. He told the Bournemouth conference that, while great advances were made under Tony Blair - to whom he paid tribute along with Neil Kinnock - change was required to meet new challenges. He had earlier said, in a letter to the party's ruling executive, that he wanted Labour to set ambitious long-term goals and then stay the course to meet the challenges of the decade ahead". Much of the speculation about an early poll - Mr Brown can wait until May 2010 if he wants before holding an election - has been prompted by recent opinion polls giving Labour a lead. And on the first day of the Bournemouth conference a poll in the Sun suggests the Tories are eight points behind Labour. The Ipsos-Mori poll of 1,009 adults put Labour on 42%; its lead increased from 5% in a similar poll a month ago. The poll, carried out by Ipsos-Mori on September 20-22, suggested 34% of those questioned favoured the Conservatives, with 14% for the Lib Dems. The party is also advertising for 22 jobs - including graphic designers, policy and research officers, campaign assistants and press officers, suggesting it is gearing up for an election campaign. Mr Brown's claim to be acting on Labour's last manifesto was not true, said the shadow Europe minister Mark Francois. He said: "In his manifesto he promised a referendum on the EU Constitution, but he has broken that promise. Almost every EU leader agrees that the new EU Treaty is basically the EU Constitution by another name." Lib Dem leader Sir Menzies Campbell urged Mr Brown to "stop dithering" and call an election. Do Labour members miss Blair?